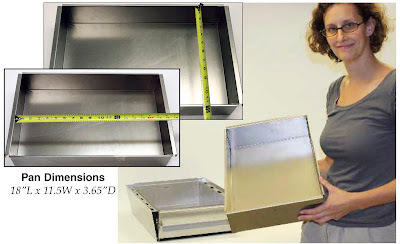 The ash pan kit consists of (from left to right, below) lid, ash pan, ash pan housing, and integral heat shield. The kit can be installed for either a right or left loading door. The ash pan comes out on the loading door side, in order to maintain reduced front clearances. The long ash door handle is easily accessible. The integral heat shield & door/handle assembly will be painted to match the color of the stove. The ash pan housing bolts to the base of the stove, (with 6 bolts) and then the shield attaches to the housing (with 6 screws). 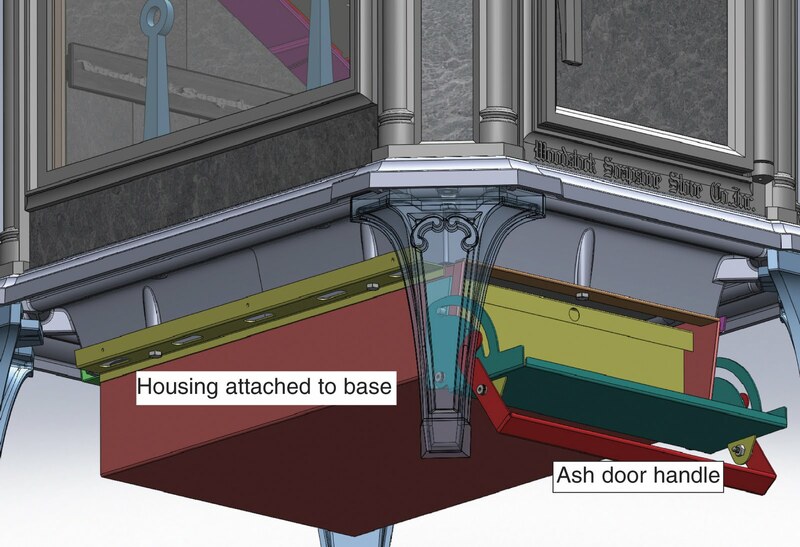 A gasket seals the ash pan housing to the stove base. Interchangeable inside the base are a grate (to go with the ash pan), or a solid plate (for a stove installed on a short leg/plinth kit, or for customers who don’t want an ash pan). 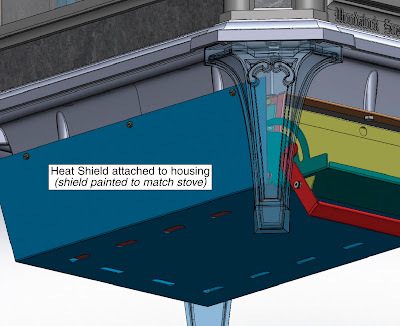 The housing and heat shield assembly are shown below. After the shield has been painted and the assembly installed, it’s not really very prominent - in fact it tends to recede beneath the stove. 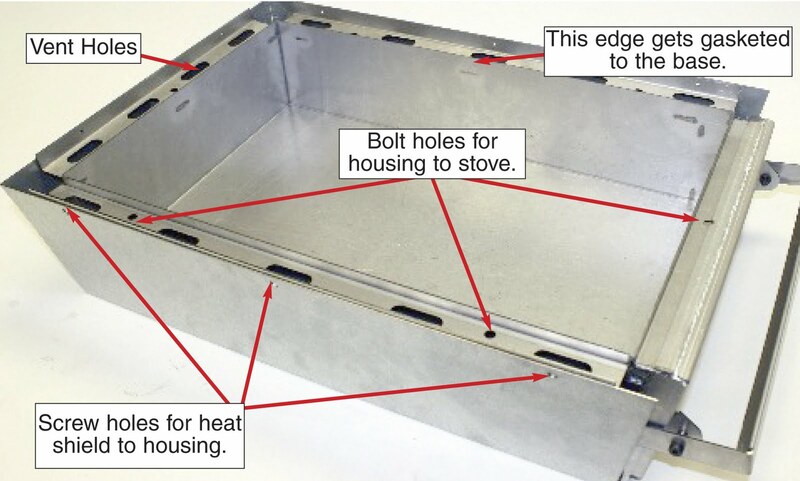 We have a “U” shaped gasket that goes over the edge of the housing and seals the housing to the base. The system is designed so that we can install it here, before shipment, or it can be easily added later, after the stove has been installed. The heat shield and vent holes are designed to prevent excess radiation down onto the hearth. When stoves are UL tested, if hearth temperatures are too high, then the UL testing will mandate a thicker (and more expensive) hearth, so the extra protection is designed to prevent that. Note that you won’t be able to see these details looking at the stove from a normal sitting or standing position - you have to be on your hands and knees!